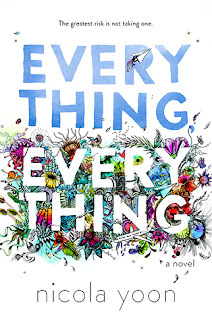 Everything, Everything is a remarkable story told through a beautiful voice which belongs to a unique narrator and a plot filled with twists, cute moments and those who make you stop and really think again about what you've just read. In Everything, Everything we follow the story of a girl called Madeline who is literally allergic to the world as she suffers of a very rare disease called SCID (Severe Combined Immunodeficiency). Because of SCID Madeline cannot leave her house, which means she's basically spend her entire life inside. Before reading this book I was aware that diseases like SCID exist and that people suffer from them but I've never been able to even as much as fathom how it must feel like to have it. Thanks to this book and reading from Madeline's perspective, I now do. All her life Madeline only had her mother and her nurse, Carla, to talk to in person. She could never make real friends, never have them come over (without extensive medical checkups and alike) or the possibility of going out with them. But, one day, a new family moved into the house next door and that's where the story really took off. a time before us. A time before time. I adored Madeline and her narration. I really, really liked her character and would have loved to have her as my friend, if she were real that is. It was really easy to understand the decisions she made and why she made them. What impressed me the most about her was the fact that despite having such a hard life, being so restricted and limited in terms of things she can do, she never stopped being a happy person. She is friendly, positive and just a very strong character in an entirely different way then characters usually are when you call them "strong". And then there was Olly, the boy next door, who was intriguing and fascinating from the second on in which he appeared in the story. He is the exact opposite of Madeline. Seeing the two of them interact, become friends and then something more was super cute and fun to read about. “You can't predict the future. It turns out that you can't predict the past either. 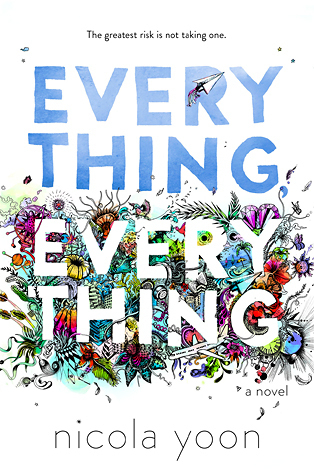 All in all, Everything, Everything is a heartfelt, unique and cute story you should definitely not miss out on. This story was just so good and had so many different aspects in terms of how the story is told. The characters felt like real people, their decisions and dialogues were amazing and the plot twist at the end was just wow. I definitely didn't see it coming and wasn't expecting it at all, which is always a good thing. I give Everything, Everything by Nicola Yoon 5 out of 5 Stars.